The average salary for primary-care and specialty doctors in the U.S. rose this year, although women and minority physicians still earn significantly less than white and male doctors, a new report found. Primary-care physicians will earn $223,000 on average in 2018, a 2.7% increase from last year, and specialty physicians will make $329,000 on average this year, up 4% from last year, according to the new Medscape Physician Compensation Report. Physician income has been on the upswing since 2011 in correlation with a rise in demand for healthcare services after passage of the Affordable Care Act, the report said. But not everyone has benefited equally from the rise in demand. White physicians will on average earn 16% more than black doctors and almost 10% more than Hispanic/Latino physicians this year. Women also continue to earn less than their male colleagues. Women primary-care doctors will make $203,000 on average in 2018, which is 15% less than their male counterparts, who will earn $239,000 on average. The gap is even wider in specialties, where men earn about 36% more than female specialists. The report said age, choice of specialty and possible bias among managers could be reasons why gaps in pay persist for women and minority doctors. There are is also "so little transparency in salaries. Women don't even know what targets to shoot for. They are invisible," said Dr. Ranit Mishori, professor of medicine at Georgetown University's School of Medicine, in the report. 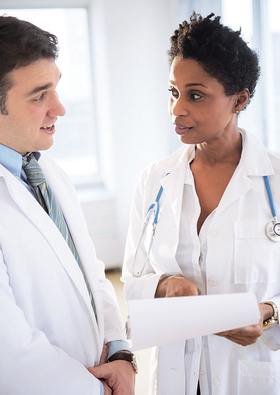 The survey found that most physicians don't discuss costs with patients, even as more patients pay for a greater share of their healthcare services out-of-pocket. Just 40% of doctors said they regularly discuss costs of care with their patients, while 45% occasionally did so and 15% never did. Most physicians—56%—spend 30 to 45 hours per week seeing their patients. But the time spent on each patient visit varies. About 22% of doctors said they spend nine to 12 minutes with a patient, while 29% said they spend 13 to 16 minutes, and 33% reported spending 17 to 24 minutes per patient. Just 11% spent 25 minutes or more with every patient. A lot of doctor's time is spent on paperwork, and it's getting worse, the survey found. Nearly 70% of physicians spend more than 10 hours per week on paperwork or administrative tasks, which is up from the 57% of doctors who reported that much time last year. The survey included responses from 20,329 physicians across 29 specialties in the U.S. from November 2017 to February 2018.